The final chapter of the event is here and readers finally get resolution to the lingering question of who killed The Watcher. 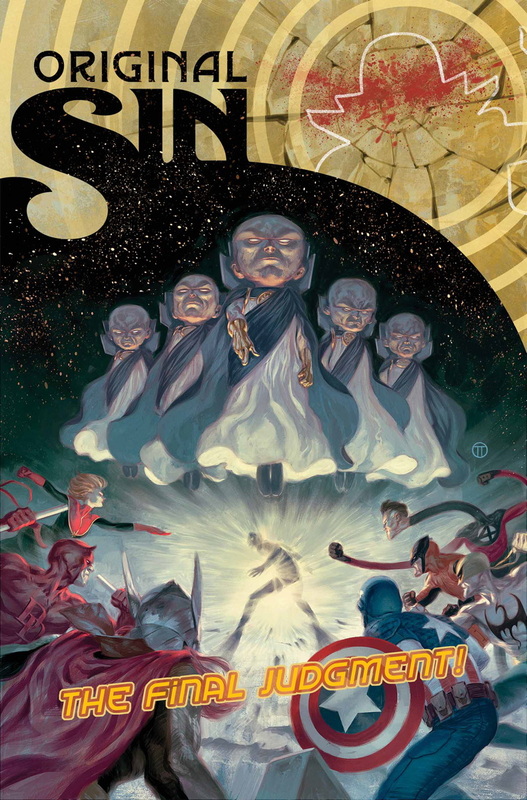 Jason Aaron brings the event to a close in a blazing fashion with high action from start to finish in Original Sin #8. This is the battle royale readers have been waiting for, and Aaron finally lets some answers be revealed with respect to Old Man Fury and what he’s really been up to during this event. This event has slowly transitioned from being a line-wide story to a Nick Fury tale with some very interesting consequences, and the focus of this issue is really on Fury and The Watcher. Readers finally get a glimpse of The Watcher’s final moments, who pulled the trigger, and while many questions are answered, just as many remain to be explored in titles like Thor and Avengers going forward. 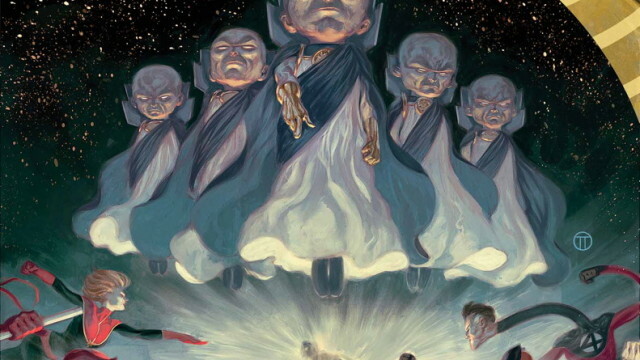 That may be one of the greatest strengths of Original Sin as an event is the ripple it has caused and how it is driving storylines heading into the massive Time Runs Out event, but at the outset I will admit to wanting more of a standalone event and not one meant to be a springboard similar to Age of Ultron. That said, the quality of this final issue is vastly superior to Age of Ultron, though it has its flaws. Some of the events within are rather predictable, and the lack of finality in some of the storylines is frustrating. Aaron does throw some curves, as he has all event long, and he still writes Nick Fury very well, but until the final page I’ll admit that the conclusion did not feel satisfying in many ways. There are so many events left to occur outside the pages of Original Sin that this event feels far from over and there is something wrong when the concluding issue of a series does not feel like an adequate conclusion. Those issues aside, I was entertained by this comic. I’ve always been a Nick Fury fan and Aaron writes the character very well. There are some exciting aspects to this comic that will be interesting for writers to examine going forward and the energy of that is palpable in the issue. So, while there may not be a lot of finality in the issue, there is more than enough excitement within to make it a worthwhile read. Mike Deodato keeps on keepin’ on with this issue, delivering solid artwork as he has all event long. This is the most explosive issue by far and Deodato does not falter with the action heavy moments at all, penciling the most powerful looking Watcher I’ve seen in ages and a tough as nails Nick Fury even when he’s damn near down for the count. He handles this cast well and sets the perfect tone for the conclusion of this series, keeping the presence of shadows high at all times because, let’s face, there’s still a ton of questions floating around. Deodato is a top flight talent and he shows it with this issue, bringing the series home on a visual high note and I look forward to reading the entire event from start to finish to immerse myself in Deodato’s artwork. Original Sin #8 does not fully stick the landing, but it doesn’t blow it by any means, either. The focus on Nick Fury is higher than ever, but considering the story so far, it makes sense. Readers get some answers amidst some huge action, and there will be ramifications (and some exciting storylines) to come in the Marvel U for quite some time. I’ll admit that I’m going to miss Original Sin, and I think the event was a success as a whole, and I’ll be in for any event helmed by Aaron or Deodato in the future.